Enjoy this FREE color by number. Kids love to try to disguise their turkey at Thanksgiving time! This activity includes everything you need to disguise your turkey and create the Thankful Turkey craftivity. 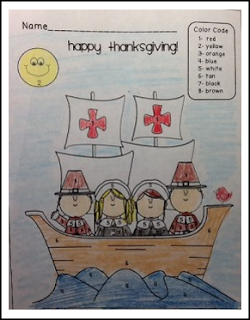 11 page emergent reader which is a great transition into the Disguise A Turkey Activity. It is an original story and works on sight words (can,see,you), picture clues for unknown words, and positional words. Thanks and don't forget to earn credit by providing feedback!